Algorithms in Artificicial Intelligence (AI) are having increasing impacts on individuals and society with great benefits as well as potential harmful bias which needs to be addressed from the onset and not as afterthought. 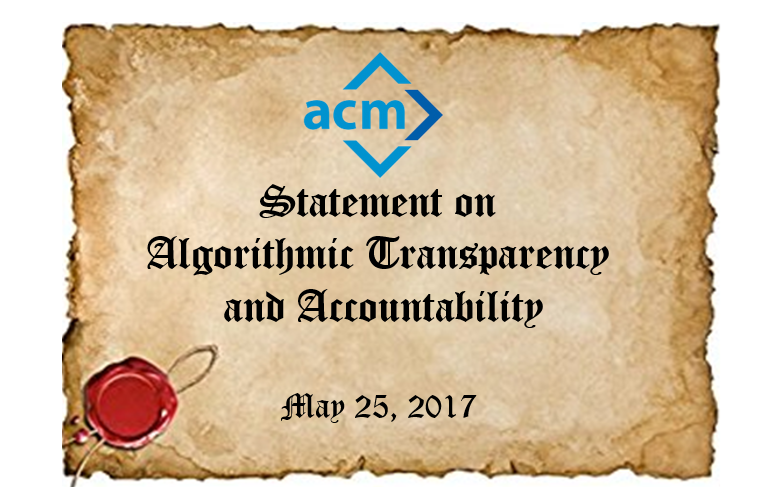 On May 25, 2017 the ACM U.S. Public Policy Council and the ACM Europe Council Policy Committee released a joint Statement on Algorithmic Transparency and Accountability which sets out the following set of principles which should guide every phase of system development and deployment to the extent necessary to minimize potential harms while realizing the benefits of algorithmic decision-making: 1) Awareness 2) Access and redress 3) Accountability 4) Explanation 5) Data Provenance 6) Auditability 7) Validation and Testing. The Statement above was designed to be consistent with ACM’s Code of Ethics which is currently being updated.